Explore, Learn, Have Fun! : Paula Deen Live! Holiday Show Atlanta area only! 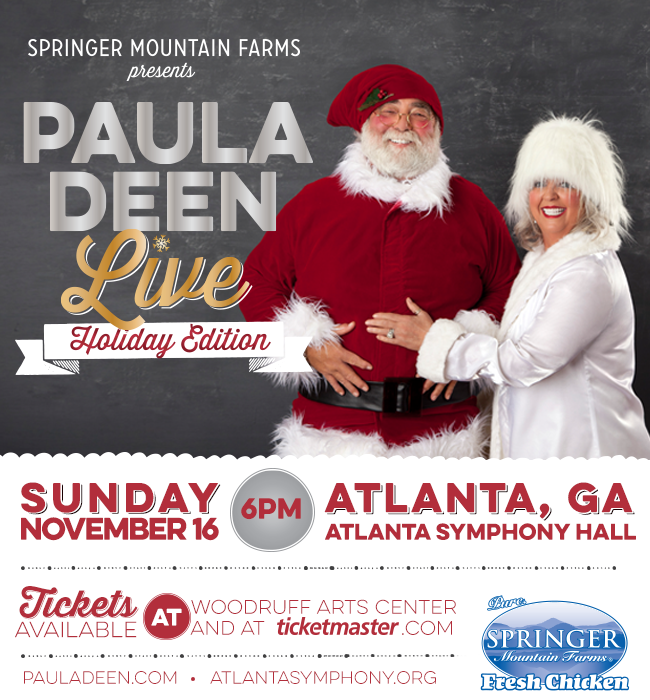 Come see Paula's live show at the Woodruff Arts Center in Atlanta, GA on Nov 16 and get a heaping helping of Paula's recipes, some good old-fashioned fun and lots of laughter. Join Paula as she demonstrates how to make her favorite seasonal dishes, shares family stories and plays cooking games with her fans. Some lucky audience members will even get to join Paula on stage! How awesome would that be?! To enter, I've got a rafflecopter widget below with a few mandatory entries, and several optional ones - enter as many times as you'd like using the available entry methods. A few are available for you to do every day so come back often! Please share this giveaway with your Atlanta friends, and good luck!! Disclosure: I am receiving a free gift from Springer Mountain Farm at a blogger event Monday, plus tickets to the Paula Deen show for personal use, as well as two tickets to give away. No other compensation was received. I will give my tickets to my Hannah! She loves Paula! I commented on the Nutin' But Fun Giveaway! I will take my beautiful 10 yr old daughter who LOVES to cook and LOVES Paula Deen! I would take my mother out for a night on the town. I would take my hubby!!!! <3 Paula Deen!!!! I commented on your Homeschooling post. I would take my mom. She loves Paula Dean! Love me some Paula! I miss watching her shows on TV. I would take my daughter out for a girls night out on the town! my best friend and husband!